Nissan has released details on the Pivo 2, an advanced electric concept car that will debut at the upcoming Tokyo Motor Show. 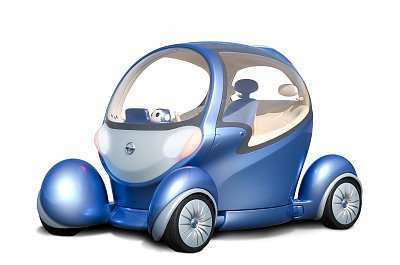 Pivo 2 builds on the popularity of the first Pivo, shown at the 2005 Tokyo Motor Show. Powered by advanced Compact Lithium-ion Batteries and featuring a unique rotating cabin – meaning no reverse gear required – the first Pivo became a hit at motor shows from Beijing to Geneva. Pivo 2 takes the idea of an environmentally friendly electric urban commuter vehicle and delivers fun, functionality and a unique relationship between the car and driver. Pivo 2 is powered by advanced Compact Lithium-ion Batteries and employs ‘by-wire’ technologies for braking and steering. Where the first Pivo, with its fully rotating cabin design, made reversing obsolete, the Pivo 2 takes that easy mobility concept to a new level. Each of the four wheels are powered by Nissan’s advanced electric In-wheel 3D Motor and can turn through 90 degrees to allow Pivo 2 to drive sideways as well as forward. Thanks to the highly innovative Robotic Agent, you are never alone in the Pivo 2. With conversations possible in Japanese and English, the Robotic Agent has been designed to work with Pivo 2 to make every journey less stressful. It provides a unique interface through which to communicate with Pivo 2 on everything from basic vehicle functions through to the nearest available parking. Pivo 2 will be exhibited – together with four other exciting production and concept vehicles at the Tokyo Motor Show, starting 27th October, 2007.